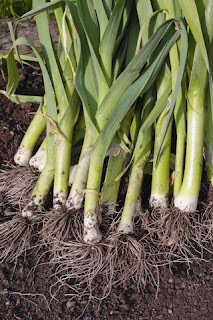 Trim your leeks, cutting away the roots and green part and the tougher outer layers. Slice them lengthways and run the slices under a cold tap to clean them off. Slice the onions, chop the squash into 2.5cm/1” cubes, melt the butter in a large saucepan and add all the vegetables. Give them a good stir and add some salt. Cover the pan and simmer very gently for about 20 minutes, making sure they don’t stick and the butter doesn’t burn. Now add the stock and milk, season with pepper, cover the pan again and simmer on a low heat for 20 minutes. When ready, pour the mix into a liquidizer and blend to a smooth puree. Return to the pan to simmer very gently, add the chopped chives. When hot serve topped with some grated Parmesan cheese (optional) and some nice ciabatta or other crusty bread.